The SKP13065EQ3-2 features a 5.1" paraboloidal mirror. Its 650mm focal length and larger aperture allows for more magnifcation without loss of image quality compared to smaller aperture telescopes. The EQ3-2 mount supplied with this unit can be upgraded to a full GOTO mount with the optional SynScan upgrade kit. 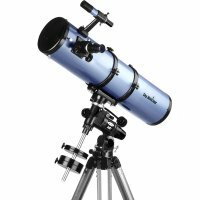 -130mm primary mirror collects 30% more light than 114mm, revealing more space treasures with better resolution and brighter image. -Short focal length design, ideal for astrophotography.